A portrait of a woman (identified as na Namarusu, i.e. the mother of Namarusu) standing in a homestead, with a hut behind her. 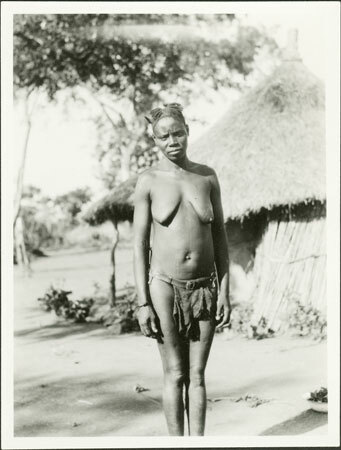 She is wearing a leather belt with a small agbaya apron in front and has some keloid patterns on her abdomen. Notes on print/mount - "2 186 EPA 588"
Morton, Chris. "Portrait of a Zande woman" Southern Sudan Project (in development). 03 Jan. 2006. Pitt Rivers Museum. <http://southernsudan.prm.ox.ac.uk/details/1998.341.588.2/>.